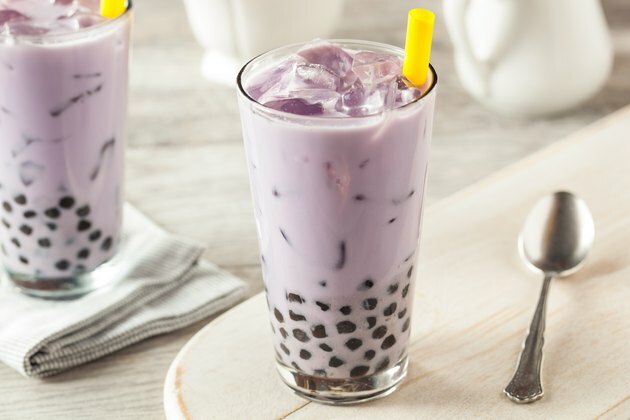 Filled with fruit, milk and tapioca balls, taro bubble tea — also known as taro boba — was invented as a tropical treat for children in 1980s Taiwan. The taro drink craze crossed the ocean, and you'll find bubble tea stands in Hawaii, New York City and along the West Coast. A 16-ounce taro bubble tea has approximately 278 calories, making it a lower-calorie alternative than a sweetened coffee drink of the same size. Starbucks Caramel Frappuccino, for example, has 420 calories for a drink of the same size. A taro bubble tea's calories depend on the amount of sugar and tapioca you put in it. Five teaspoons of sugar is typical in a 16-ounce cup, delivering 81 calories. Add or subtract 16 calories per teaspoon of sugar if you decide you like the drink more or less sweet should you make it at home. The delicious black tapioca bubbles at the bottom create the bulk of the calories. There is about a third of a cup of them, which come with 180 calories. Taro boba tea adds a punch of sweetness thanks to the fruit flavors sweetening the tea. The treat delivers about half the sugar of a can of soda: 22 grams of sugar in taro bubble tea compared to 52 grams of sugar in a 16-ounce bottle of Coca-Cola, for example. The sweet tea is higher in total carbohydrates, however, delivering 68 total carbs to Coke's 52. That means you're going to want to pass on this tea drink if you're on a carbohydrate-restricted diet such as keto. A significant amount of the extra carbohydrates come from the taro root, which is 100-percent carbs. The pearls are low in cholesterol, saturated fat and sodium, but deliver a relatively high glycemic load of 94, despite the fact that they don't fall into the sugar category. You won't have to worry about feeling jittery from the caffeine in taro boba tea. Each 16-ounce serving contains 1 cup of black tea, which delivers 25 to 48 milligrams of caffeine. By contrast, a cup of coffee serves up 95 to 165 milligrams. So don't worry about staying up nights if you enjoy a refreshing cup of taro bubble tea at teatime in the late afternoon. Odds are, the small amount of caffeine won't do much to keep you awake all night unless you're particularly sensitive. The National Sleep Foundation considers 250 mg of caffeine to be a moderate daily intake, and advises not drinking caffeine immediately before bed if you have trouble falling asleep. Taro powder or cubes gives taro boba tea its pinkish tint, but you can add ingredients such as fruit to complement its nutty vanilla taste and alter the nutrition. Watermelon, mango, strawberries or other pink or orange fruit are naturals to complement its tropical taste, but be sure to account for extra sugar and calories when adding fruit. Some variations add jellied fruits, which are higher in both sugar content and calories than fresh fruit. How Many Calories Are in Tapioca Bubble Tea?